Who is Bedrock's coolest housewife? That would be Wilma Flintstone. She is always dressed in the best white dress and makes the house work look so easy with the help of her dinosaur helpers. But let’s not just give her the housewife label – after all, she does have to deal with all of Fred’s wacky schemes and shenanigans! Don’t leave your cave looking anything but fabulous this Halloween – you know Wilma only went out looking her best! After all, Fred was always a little barbaric, so someone had to class up the place a little. If you truly want to rock the Bedrock look for a theme party or Halloween, be sure to add a pair of female cavewoman feet and our deluxe Wilma jewelry set – you’ll steal the show without having to say a word! Now you can join Fred for a fun Halloween this year when you wear this classic cartoon character costume. This Wilma Flintstone costume comes complete with everything you need to show off your best around Bedrock this Halloween. 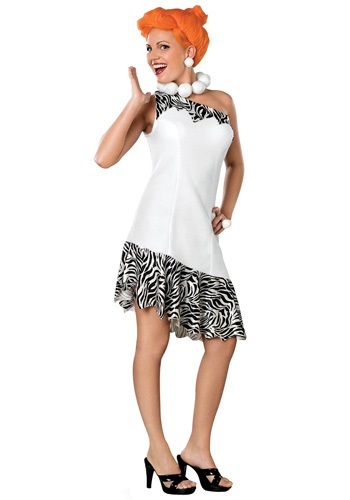 The 100% polyester white dress has a single shoulder strap with tattered zebra trim along the top and bottom to recreate Wilma’s classic style. The large plastic necklace resembles Wilma’s best stones and don’t forget the orange wig styled just like Wilma loves to wear her hair. This is a fantastic plus size women’s costume that is sure to stir up some nostalgia this Halloween. Don’t forget to ask Betty and Barney to join you for a couple’s night out! Wig and necklace are fine. The dress is a little small and way too short. I'm only 5'4" and the short part hits above mid thigh. I will be spending Halloween in Maui this year. I should be quite a hit with my Wilma costume... Nice outfit for a large lady like myself. It will easily pack in my luggage... Wish the item came in larger size so I didn't have to alter. In real clothes I wear a 14, and typically costumes seem to run pretty small. A 'One Size All' or even a 'L' has never worked for my size. So, I ordered a Plus size (as I did last year with another company ~ which fit great), but this Plus size Wilma Costume was very large on my. Much too big. And it had a slight whole in the side where the seems weren't stitched together all the way. I am exchanging it for the next size down and praying it won't squeeze me. I am not the kind of chubby girl who wants to looks like I am wearing a white sausage casing. (ps: the material is like a heavy felt ...which is strange, but workable). I had reservations about ordering this dress as the zebra print was throwing me off, which is just my personal preference. I felt the dress was not true to size and was WAY too short. The wig was awful. I even tried to restyle it to no avail. I had to make a dress and I cut pieces of the wig off and added it to my own hair to have some red in it. This however is the chance you take w mail order! Bought this costume and was very disappointed, first, the fit sizer was wrong and the costume was to big, second, the material was so thin you could see right through it. I bought the Fred costume that was not bad, but the material on the tie was the same material in the Wilma dress. CHEAP, CHEAP, CHEAP, NEVER AGAIN.